I got yarn in the mail this week. Can you believe these colours together? Now, I'm pretty sure you can relate when I say that I've been feeling the teensiest bit hemmed in by all the stripes around here. Thinking maybe it's time for some lace, or some seriously heavy cables. 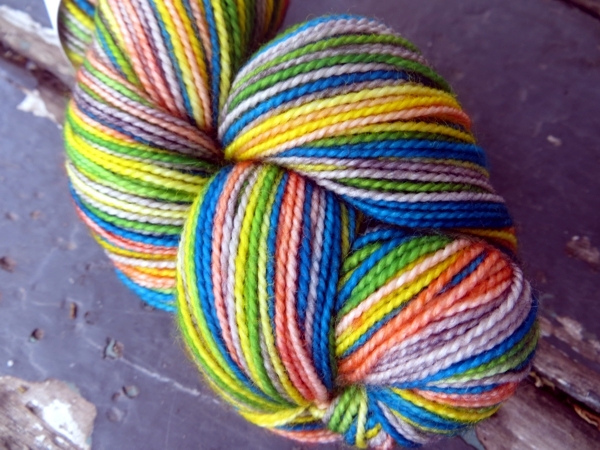 But this yarn? Wowza, does it ever make me want to cast on yet another pair of socks. Chemo socks - that's brilliant, Paula! Big comfy socks always make me more cheerful than anything else - if I were going through that, they would be the best ever. Happy knitting!